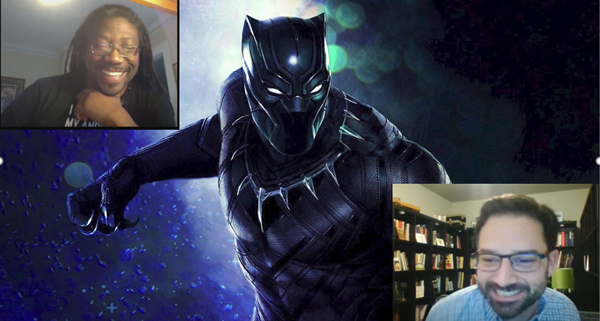 In this episode of the RavenCast, I talk with Melvin Bray about the hit movie Black Panther. The movie has not only broken records at the box office, but has created many cultural conversations about racism, political power, violence, and white supremacy. Melvin and I discuss these important topics in our conversation. You can listen to the audio of our conversation by clicking the link above, or you can watch the video below. You can also subscribe to the RavenCast on iTunes and Stitcher Radio. Melvin is a storyteller, author, and social entrepreneur. He is a guest speaker at conferences and is author of the book Better: Waking Up to Who We Could Be. Melvin is the principal consultant at Collabyrinth, where Melvin helps communities of good will design better structures and systems, policies and practices that lead to more equitable outcomes for all people. You can find more of Melvin’s work at collabyrinthconsulting.com and better.melvinbray.com. If we learn to tell more beautiful, more just, virtue filled stories, then we can live into a beautiful, more just, virtue filled world. If we don’t tell those stories, then our children have no reason to care about faith. Wakanda is a metaphor for the Beloved Community. Wakanda gives us a metaphorical image of how we can do better and explore our obligations to the broader world. What’s important about Eric Killmonger? On the underside of Empire, you don’t have to be Eric Killmonger in order to be treated like Eric Killmonger. Look at the difference between Black Lives Matter kids and the Never Again Kids. Both are doing good things, but Black Lives Matter kids aren’t treated as gently. They have been demonized. Both children are saying something important, which is that their lives matter more than the gun industries ability to make money. Killmonger is a monster. But the truth about Killmonger is that he’s a product of America. “Supremacist logic” means a notion that is never challenged that “we” are going to be on top. It will steal from other cultures and claim it as their own. This is shown in Black Panther with the scene in the museum. But there are other examples, like The Matrix and The Help were both originally written by black people, but then stolen by white people. These are examples of continued colonialism. The way supremacist logic frames the gun debate is “second amendment” versus “gun control.” These are basically two power factions determining who is going to be on top. There’s an old African proverb that says “When elephants fight, the grass loses.” Neither framing of the gun debate takes into account the most important part of the debate, which is a person’s right to live. Underlying the gun debate is the issue of money. 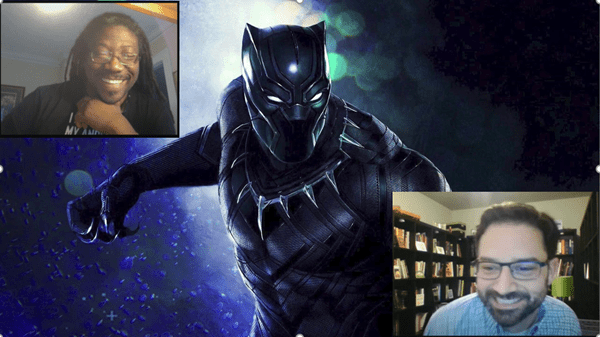 Brothers versus brother are archetypal themes in Black Panther and in the Bible. These themes are less about individuals and more about archetypes of people whose goals tend to conflict over the same object. For more on the archetypal stories, you can listen to Melvin’s MP3s “The Stories in Which We Find Ourselves” at melvinbray.com/engagements. Scroll down to the ePressKit section, click on audio, and you will find samples. Through certain characters, Black Panther models for white people how to be more beyond being an ally and move into being in solidarity with black people. Any comparison between T’Challa and Martin Luther King Jr or Eric Killmonger and Malcom X are based on simplistic caricatures created by supremacist logic and forces that killed both men. Malcom X never called for taking up arms. He said you should value your life so much that you are willing to defend it, but only if necessary. Malcom X was no Killmonger. Supremacist logic distorts the message of Malcom X and Martin Luther King in order to demonize one and domesticate the other. Great discussion of a very perceptive film Melvins interview also helped my understanding.